Shirahige Shrine, in Shiga Prefecture, is a popular shinto shrine which appears to be floating out on Lake Biwa. 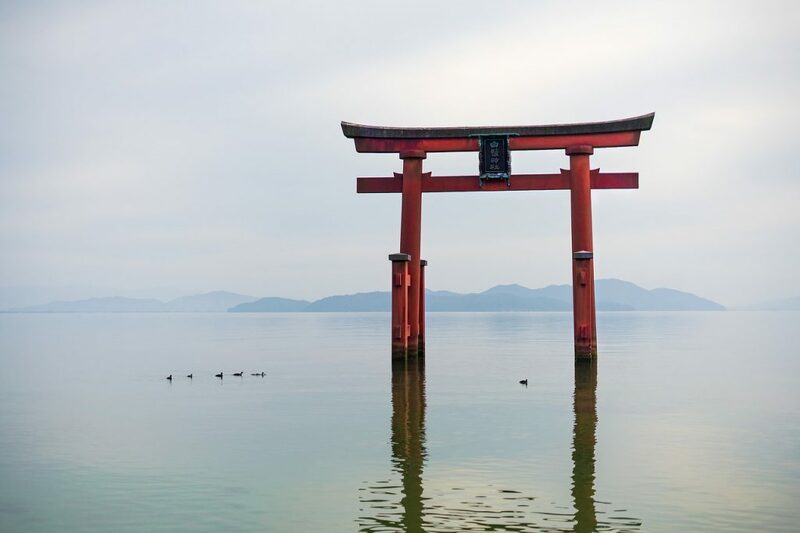 The Torii Gate to this shrine gives a very similar apperance to the famous Itsukushima Shrine of Hiroshima Prefecture, and many people can not tell them apart by just looking at the pictures. However, in person, it is clear that the Shirahige Shrine is considerably smaller than it’s counterpart in Hiroshima, and definitely not as touristy. However, Shirahige Shrine offers a hidden photographers paradise, as many have yet to discover this hidden beauty. The shrine building is on land, about 50m inland with a direct line of sight to the Torii gate. Please be careful around this area though, as to get to the shrine building, you will have to cross highway 161, where cars are often passing by. Shirahige Shrine is located just a few minutes south of the city of Takashima, and can easily be access by car or bicycle if you have either option available. Luckily, you can actually rent a bike from Omi-Takashima Station and take a nice short bike ride along the lake front on Route 161. The Shiga Biwa Lake Shanshui house is a type of guest house accommodation, similar to an AirBnb. It’s a short walk away from the lake front. The Imazu Sun Bridge Hotel is a lakefront Hotel, offering stunning views of Lake Biwa on one side, and beautiful views of the mountains to the other. It’s a great place to stay. The Grand Park Hotel Okubiwaka Makino is another great hotel to book, located right on the shore of Lake Biwa, offering rooms with Lake views as well.